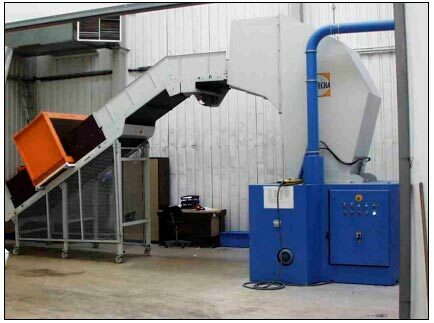 The RS 6000 Series Granulators are designed for applications requiring the best built, heavy-duty granulators for particularly demanding applications. 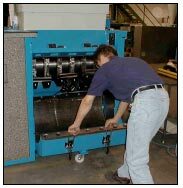 Screen cradle rolls on casters and with very little effort can be rolled completely out from the cutting chamber. With the screen cradle removed, access to the cutting chamber is unmatched. Note the reverse mounting style of the blades to the rotor shelf. By affixing the blades to the underside of the blade shelf, the blade positioned in reinforced during operation. 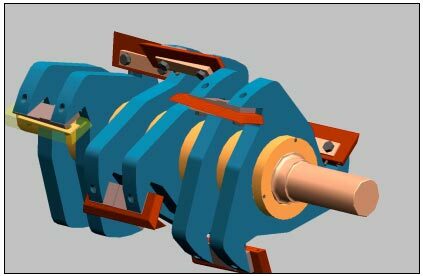 With this mounting design, the lifting affect on blades in very heavy-duty applications is eliminated, greatly reducing the need to rebuild the rotor blade mounting shelves resulting in a significantly lower cost of ownership with the granulator. 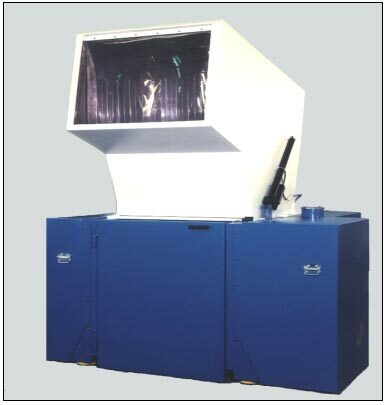 Granulation of automotive parts in single man operated granulating room with limited space. 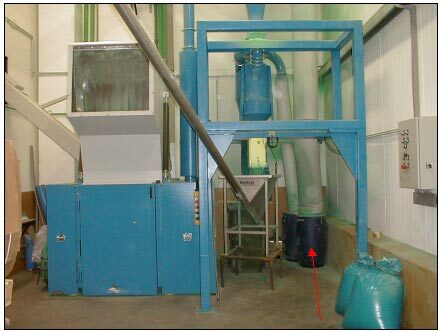 Safety factor of operator falling onto conveyor belts and into granulator expressed by customer as major issue. The RS 6009 with a 85 HP motor was used for this application. For reasons of space, only a short conveyor belt and a hopper with lower inlet-height could be applied for the granulator II. 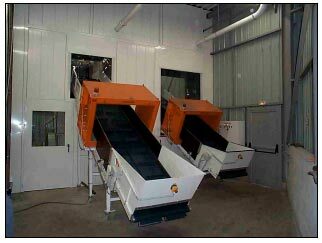 The longest parts will therefore be granulated on granulator I. 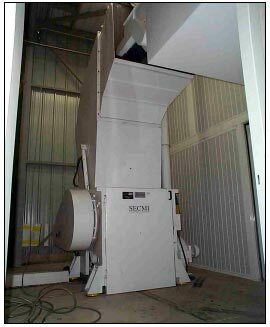 - Housing for the sound insulation of the granulators adapted to the granulator space. 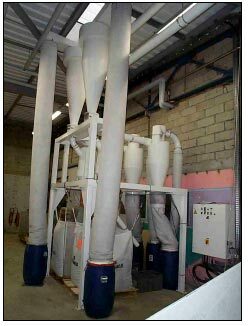 - The air separation blowers are fitted with frequency converters so that the optimal de-dusting level can be set in a very sensitive manner. 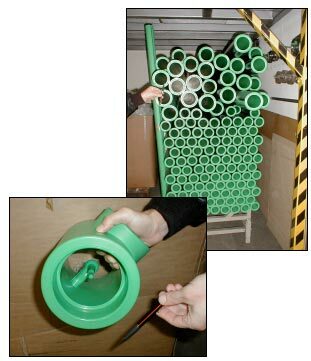 - The share of dust is stored in a closed plastic barrel. The barrel can be comfortably emptied. Getecha supplied the complete system, installed it at customer's site and performed initial operation together with the customer. In the process, the operating personnel were intensively trained. SAFETY ISSUE:	To address the concern about the single operator safety factor, Getecha recommended a metal detecting pad at the entrance to the room. The procedure required any person entering the room be stand on the metal detector (located at the foot of the door) to insure the metal-toed shoes are being worn. When a person stands on the device with the metal-toed shoes, the door unlocks and allows for passage into the room. 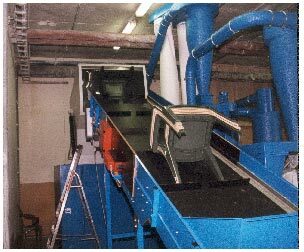 Due to the metal detectors on the conveyor belts, should an operator fall onto the conveyor belt, the belt will stop prior to the operator being transported to the granulator. 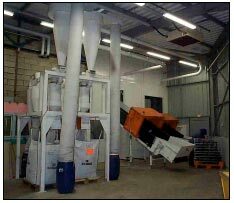 - Press-in device: while feeding-in stacked-up chairs, they may fall apart in the hopper and block passage. 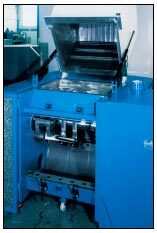 Then, the operator activates a switch which runs the pneumatic press-in device in the hopper downwards. It presses the chairs into the open 3-blade-rotor. 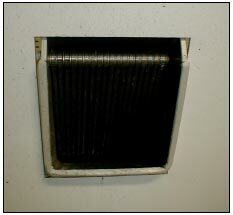 - Transport blower for discharge to the air separating system. 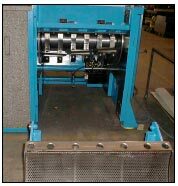 The slide valve is moved by two pneumatic cylinders. The operator has a big switch on the delivery station. As long as he presses the switch the cylinders run out downwards. 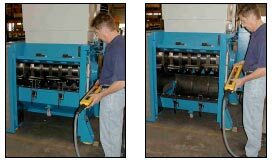 As soon as the operator releases the switch, the cylinders run upwards again. 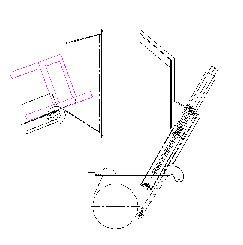 The slide valve is used when required.